Glasscoat is the newest production unit of the 3V Tech. A brand new glass lining facility was established in 2008 in Noventa di Piave near Venice, Italy. The staff at 3V Tech is a mix of engineers and technical specialists that have years-long experience in the glass lining industry, as well as young engineers which have grown with the organization since its inception in 2008. 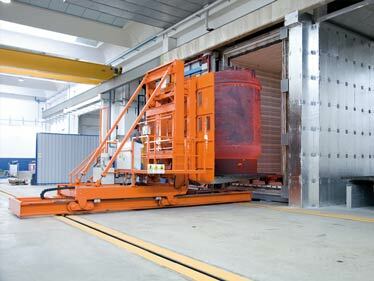 3V Tech glass lining facility is equipped with customized software controlled electric furnaces. For every new vessel a specific firing program is developed and stored in our central data base. These customized firing programs allow us to exactly reproduce the same firing cycle for repeat jobs and optimize our vessel production to achieve optimum repeatability and prime glass quality. The plant also maintains a well-equipped lab that supports current production and develops new, advanced glass types. Our primary glass is G2208 has a number of superior characteristics. In addition to its excellent corrosion resistance to acidic process environments, it is distinguished by higher thermal shock resistance and smoother surface finish than other glasses. The G2208 glass is available in: dark blue, light blue and white. The corrosion resistance for all three colors is the same. Phi Glass is a new formula that improves the limited heat transfer properties of the glasses commonly used in the chemical industry and improves heat transfer rates across the glass interface. The glass was developed by the study of the behavior of ceramic particles in hot and cold conditions. Phi Glass is a hybrid glass that includes a percentage of ceramic particles which impart enhanced heat transfer capacity to the glass. This glass is available in light blue color and is the first of its type that has been introduced in the glass lining industry. SIGMA glass is not the first of its type but it is innovative in the sense that it advances the concept of electrically conductive glass. This glass offers an enhanced electric conductivity through all layers of its lining, from the ground coat up to its last layer, thus making an electrical connection between the process fluid and the substrate. Since the introduction of SIGMA glass to the market is has become the glass preferred by the major manufacturers in central Europe and in Asia. Glasscoat uses a unique application technology that creates a glass with a smoother surface and finer bubble structure resulting in lower air content. The lining consists of several layers applied and fired at temperatures in excess of 800 °C. The unique dust/liquid application technology allows Glasscoat to achieve the final thickness with fewer layers and trapping less air into the glass matrix. The result is a glass with a micro bubble structure and better dielectric proprieties. As proof we test all vessels at a Glasscoat standard of 30.000 V - 10.000 V to 15.000 Vhigher than the voltage used by other manufacturers in the market. 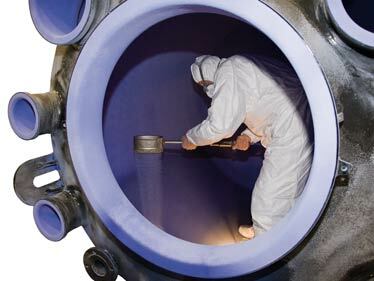 Glasscoat Engineers are familiar with European, American and Chinese pressure vessels codes, cGMP, Explosion Protection standards (ATEX and NEMA) and are familiar with the often higher technical standards of the major European customer accounts and their counterparts in the rest of the world. Glasscoat’s product portfolio covers the full range of chemical synthesis from reaction to distillation to separation and drying. The production of glass lined process equipment is Glasscoat’s speciality as it is part of 3V Tech and can therefore rely on the more than 40 years of experience in producing process equipment for the Chemical Synthesis and the Pharmaceutical industries. The cGMP design, clean room suitable and high containment equipment that has been a hallmark of Cogeim designs is also available as reaction equipment from Glasscoat. 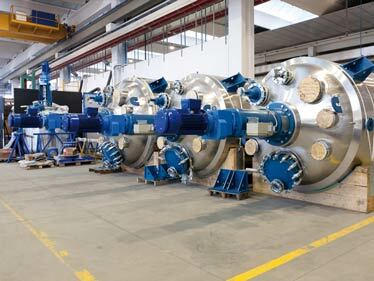 Glasscoat produces glass-lined pressure vessels according to the DIN and BN standards and according to ASME Code. 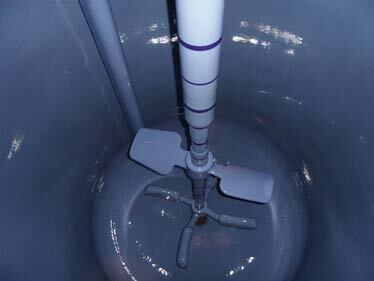 Standard vessels such as jacketed and agitated reactors, storage tanks, receivers, columns, pipes, and vessel accessories are all part of our standard product line. 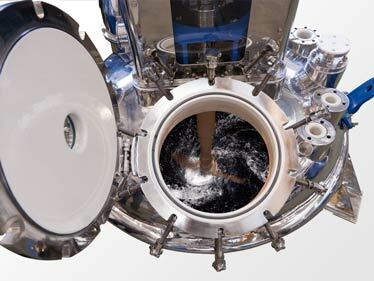 As one of the world’s leading specialists in glass-lining, Glasscoat also manufactures high pressure vessels such as hydrogenators as well as very specialized glass-lined equipment such as thin film evaporators, condensers, falling film evaporators, double cone dryers and blenders, nutsche filters, separation columns, vapor lines, jacketed piping, phase separators and very complex geometries like large helices. With our expertise in glassing, Glasscoat is willing and able to glass-line geometries that other companies will not even attempt. Glasscoat reactors can be equipped with conventional one-piece agitators or our 3V Press-Lock Agitation System mixing technology. 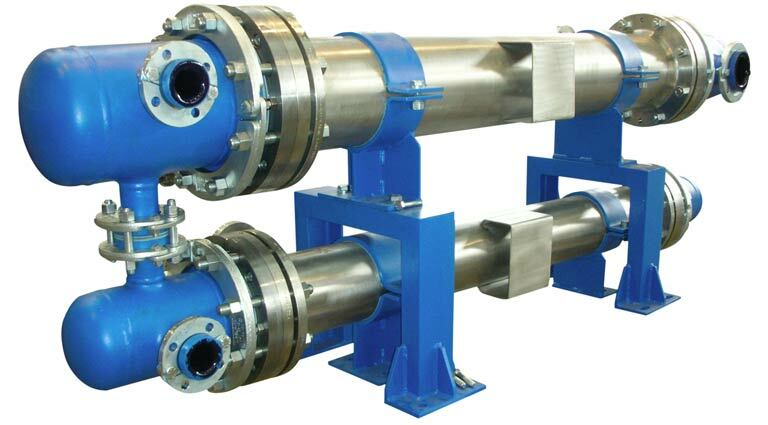 3V Press-Lock agitators are specially designed for better mass transfer, heat transfer and gas dispersion. We can design mixers for very specific applications and optimize mixing solutions for multipurpose chemical synthesis, covering a wide spectrum of process conditions. 3V Tech Process Solutions division supports the Glasscoat, Cogeim and Mabo engineers in the design and selection of the optimal solution for each customer’s specific requirements. Instead of just offering individual pieces of equipment, the 3V Tech Process Solutions approach is to leverage our full spectrum of capabilities to offer complete packaged solutions for process equipment for reaction, evaporation, thermal separation, solid-liquid separation and rectification. 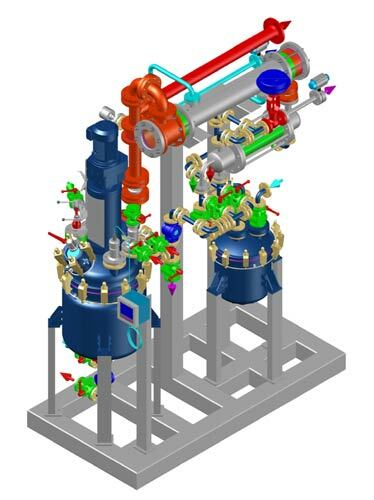 3V Tech Process Solutions creates complete, skid mounted systems with full PLC, instrumentation, valves, fittings and other components in conjunction with the best combination of equipment from the Glasscoat, Cogeim and Mabo product lines in most construction materials. In this way 3V Tech can create a customized solution tailored to the individual needs of each customer.